Join Captain Scott Hewitt for a Lake Erie fishing charter aboard a 30ft Pursuit Offshore vessel. 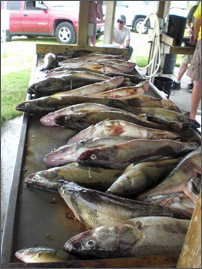 Hammer Time Charters specializes in Lake Erie's Central Basin, the walleye capital of the world! We provide full and afternoon charters for both first time fisherman to experienced pros. Our charters run from Fairport Harbor to Ashtabula following the seasonal changes in fishing patterns. You can count on Captain Scott knowing where the fish are with over 15 years of experience, tournament fishing, and a vast knowledge of this great fishery. Safety and customer satisfaction are the focus of Hammer Time Charters. Captain Scott is a US Coast Guard Masters License holder as well as being a fully insured operation. Much detail is given to weather conditions both prior to departure and once on the Lake. At Hammer Time Charters, your safety is our first priority. Hammer Time Charters caters to all different levels of fishing experience with a focus on creating a relaxing, fun-filled adventure that is guaranteed to provide lasting memories. Please do not hesitate to contact me directly (440-478-9858) with any and all questions you may have. It is never to early to reserve your charter, the season calendar fills up fast - don't miss out! ©2019 Hammer Time Charters, LLC, All rights reserved.